KBBF (Potassium Fluoroboratoberyllate, KBe2BO3F2) is a new and unique nonlinear optical crystal which allows straightforward and efficient generation of deep-UV light. The fourth harmonic generation of Ti:sapphire laser from 200 nm to 179.4 nm (~ 6.2-6.9 eV) was first achieved in KBBF crystal through the directly doubling of the second harmonic. It is also the only crystal in which the direct SHG of the third harmonic of Nd:YAG laser is possible (i.e. sixth harmonic of Nd:YAG at 177 nm, ~ 7.0 eV). Due to the plate-like growth habit of KBBF, only thin crystals grown along the c-axis of the crystal are available at present time making it impractical to cut the crystal at the phase matching angle for the frequency conversions to deep UV. 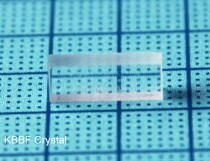 A prism-coupled KBBF device (KBBF-PCD) has to be used to couple the incident light into the KBBF crystal. We encourge customers to send us the detailed information about the intended applications with the input laser parameters and the desired deep-UV parameters. We will work with you for the most suitable solution with KBBF crystal.